Pre-order for $199... shipping in September for Collector's Edition and October for the standard version. "Thank you for your patience and amazing support. This video is for you. 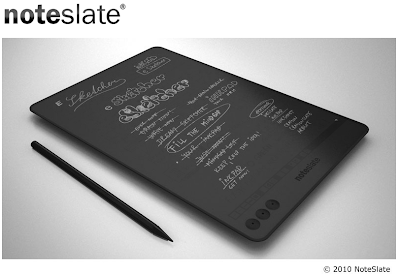 It's showing drawing and writing on actual Noteslate SHIRO prototype, monochrome paper alike 6.8inch tablet device with simple pencil interface, the first and the earliest available Noteslate device. Paper replacement. Pre-order will be launched on 15th January 2015. We'll keep you posted. Thank you!" There seems to be a lag between the writing and the appearance of the lines. Does it look that way to you? It says this is a prototype, so I will cut it some slack, but it doesn't look like the elegant paper replacement solution for which I was hoping. NoteSlate is making bold statements again via Twitter. The link takes you to the noteslate.jp site. I'm sure not what "Shiro" is. I signed up for the notification. I assume "this year" means 2015. Otherwise, we would see something very soon. Also, the e-mail sign-up gives an address in the Czech Republic. Not that it matters - I just had no idea where they were. Thank you for being with us. We spent last three years building Noteslate device. We'll bring you the first one soon, Noteslate #SHIRO. I'm still looking for the perfect stylus to allow my iPad to replace pen and paper completely. I wonder if this is it: Jot Script Evernote Edition Stylus. Back from the grave - at least to tweet. I'd like to know their future plans, but I'm not in Prague at the moment. Since the new iPad was announced yesterday, I thought I would check on our old friend the "too good to be true" NoteSlate. The last update on their blog was more than a year ago (17 FEB 2011) and no new tweets in months, so still vaporware. I know I declared it dead, but I can't help still hoping. Noteslate is still vapor, but I do like the dragon drawing. Dell Netbooks go into the ether. And what's up with Fusion Garage of former CrunchPad infamy, the JooJoo, and the GridOS? Lawsuits, tigers, and bears. Oh my. I knew it was probably too good to be true... a $99 digital e-ink legal pad replacement. So, I'm calling it - TOVD (Time of Vaporware Declaration) 5:45PM. The last couple of tweets from NoteSlate have confirmed it for me - both on the price and technology fronts. "We can´t hit the $99 end price for NoteSlate device... is going from low-tech vision to hi-tech reality.Sorry for our preliminary statement." "We`re still solving prototype, firmware & legals for next web(v3.0) update - vision into reality. Lot of work on table. Sorry for delay."